HomeLink building is still important for building website authority but make sure you do it right. (Bad) Black hat linking refers to the process of acquiring as many links as possible with minimal effort. Black hat SEO could also be referred to as Spamdexing as this also includes a lot of black SEO strategies and link building tactics. Some black hat link building strategies include getting unqualified links from and participating in link farms, private blog networks, and other unscrupulous link building schemes. (Good) White hat link building strategies are those strategies that add value to end users, abide by Google’s term of service and produce good results that could be sustained for a long time. White hat link building strategies focus on producing high-quality as well as relevant links to the website. Although more difficult to acquire, white hat link building tactics are widely implemented by website owners as such strategies are not only beneficial to their websites’ long-term developments but also good to the overall online environment. So what does all that mean? I think it’s fairly clear after looking at the language used by both of these two top experts that link building is still a valuable component of sound SEO and overall website authority building strategies. Their feedback also suggests, however, and anecdotal evidence indicates that unfortunately many of the black hat or gray hat techniques still out there are somewhat effective which is why those efforts haven’t died out completely. Google’s algorithms will continue to improve however you can bet on that. So over time they will be able to more easily discern between unscrupulous link building efforts and purely white hat techniques. So if i were you I would focus purely on google sanctioned type efforts. 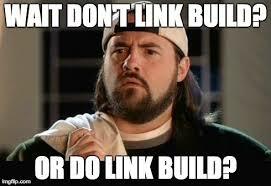 So in short, YES link build away but try to do it the right way. Also I wouldn’t necessarily lose too much sleep over a poorly constructed link portfolio either. It’s far more important to focus on having a website that provides content or services that people actually need/want to consume and web traffic will find you regardless. …or how much link spam you used to get them there. and reader interest. They think that a website is enough to increase leads. True, until google completely does away with all unscrupulous link building schemes it will still be hard for a website to stand on it’s own. That’s why many black and gray hat techniques are still widely used.